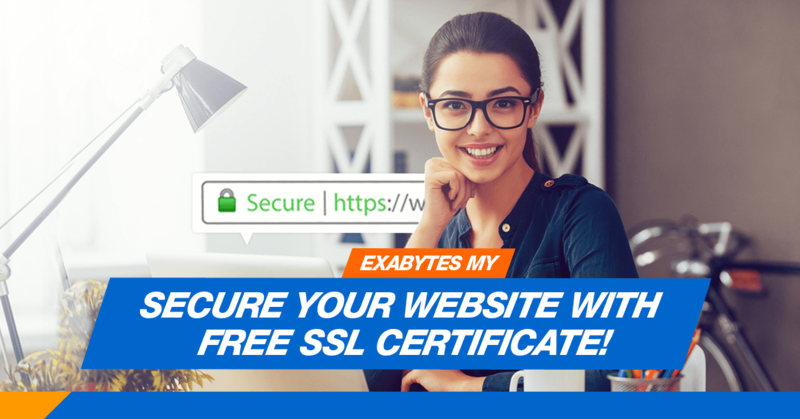 Home All About Exabytes Secure Your Website with a FREE SSL Certificate! Exabytes is proud to offer secure hosting with FREE domain validated SSL. This is because we want your business to gain more trust, customer loyalty and repeat purchases! *(FREE SSL is for Linux Shared hosting customers only). With a SSL Certificate, your website URL will start with “https://” instead of “http://”. In addition, your website visitors/potential customers will notice a green [Secure] word in the website address bar. Why your website should be secured with an SSL certificate? True enough, without SSL encryption, our data is vulnerable to abuse. Besides helping online business, Exabytes is keen on helping to encourage a safe E-Commerce environment in the country by creating a safe online experience. And that’s the reason why we are offering SSL Certificates completely FREE of Charge! There are a few different types of SSL Certificates to suit your online business needs! Check them out. Domain validated or DV certificates are the most common type of SSL certificate. They are verified using only the domain name and certificates assure the user meaning that one can be issued almost immediately which can create distrust with users especially when it comes to shopping carts. Nevertheless, DV certificates have a positive impact on user trust and conversion rates compared to websites that without certificate at all. PS: When you host with Exabytes, a Domain validate SSL is yours for FREE. Enable SSL and do your part to create a secure Internet environment! *(Windows Shared hosting customers are Not entitled to FREE SSL). **Free SSL is applicable to all Linux hosting plan signups, including existing hosting customers who currently host with Exabytes. Our Tech Team has Enabled SSL for you. Login to “.htaccess” -> Force your .htaccess to HTTPS to enable your SSL Certificate. For WordPress Users, you are able to follow the steps HERE. A step up from Domain Validation, Organizational Validation allows a business’s information to be checked through the secure site seal. The validation procedure carried out by the issuing Certificate Authority is fairly strict, checking both that the applicant has the right to their domain name and that they are a legitimate business. Visually, OV certificates in the browser bar are identical to DV certificates However, the site seal provided with the certificate typically includes additional information like organization’s name is also listed in the certificate, giving added trust that both the website and the company are reputable. (EV Certificate, Extended validation) provide the maximum amount of trust to visitors, and also require the most effort by the certificate authority to conduct an intense investigation of a business before issuance. EV certificate will also show the name of the company or organization in the address bar itself, and a green bar is added to the user’s browser to signify that the certificate holder is a trusted authority. If you run your online business on a eCommerce or corporate website, do consider changing your certificate to EV Certificate. Previous articleShowcase your BRAND with your domain! Next articleHow to Add FREE SSL to WordPress Websites?